The Eaton 9135 Power Surge Protector provides you with true online double conversion UPS with a 6000 va/ 4200 watt capacity. 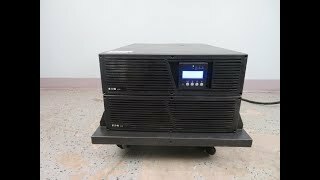 This UPS provides 4 minutes of full load runtime allowing users ample time to save their work, and power down machines safely in the event of a power failure. This surge protector helps guard equipment from surges, sags, under and over voltage conditions, line noise, harmonics and other interference. This rackmount style UPS provides clean and continuous power, delivering in only 3U. This Power Surge protector is also managed through the up front, easy to read LCD display, and has an efficiency mode that can cut costs up to 97%, that also reduces BTU by more than 60%. This Eaton 9135 Power Surge Protector has been fully inspected and is performing without issue. All of our lab equipment comes backed with our standard warranty. Should you have any questions, please don't hesitate to contact us.